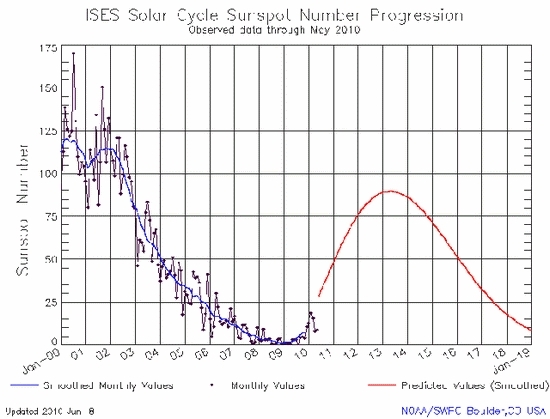 Just when it looked like Cycle 24 was going to take off the sunspot numbers turned around and started declining. As some scientist have finally concluded we really do not know what is happening on the sun. In the past, disappearing sun spots has been a precursor to long term periods of colder winters and summers. The Dalton Minimum was the most recent period from 1790 to 1830, weather stations experienced an average drop of 2.0C for 20 years. The Maunder Minimum was also a prolonged period of minimum sunspots from about 1645 to 1715, a period know as the Little Ice Age, during which Europe and North America were subjected to bitterly cold winters. Some years, rivers remained frozen well into summer. The exact mechanism for the cooling is not know, but the historical records show that fewer spots leads to a colder climate. The current sunspots trends could indicate some long term cooling is on the horizon if history is a valid indicator. There is some irony here, Mother Nature is turning done the earths thermostat and our government is setting in motion programs and legislation that will take control of our thermostats, all to stop the earth from warming from CO2 emissions. Either way, there are long term economic impacts. Stay tuned.